“Video Salon”Revisiting the good old French salons of the 18th and 19th centuries, the greatest annual or biannual art event in the Western world of the Académie des Beaux-Arts in Paris, Garis & Hahn, a Lower East Side gallery with a reputation for unconventional exhibitions, presents Brooklyn based artist/designer/programmer, Eric Corriel’s Video Salon on the gallery’s facade, taking the traditional salon out an about 21st century New York. 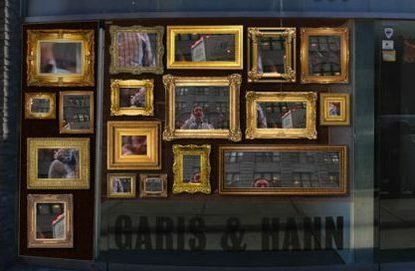 Unlike featuring royal subjects and extravagant landscapes, like its precedents used to, this interactive video installation intents to bring art out of the gallery space by placing it in an urban environment –in Garis & Hahn gallery’s case right at 263 Bowery street– where images of passers-by are the artist’s subject. At this crucial point of redefining the relationship between art (and specifically digital or the so-called new media art) and the public, subject matters relevant to artistic and curatorial practices with digital art forms in urban environments, come into the spotlight. Part of this urban exploration are platforms that, among others, include Urban Media Aesthetics that is created by Ph.D. Fellow at Copenhagen University and current participant in CuratorLab at Konstfack Universitet, Stockholm, and explores the kinds of artmaking that materialize in various contemporary examples, such as digital art installations, media facades, pervasive and mobile displays, big screens, projections of moving images, architectural mapping and animation, responsive architecture, and other types of “exhibition forms,” which take the urban environment as their exhibition space while integrating digital content, infrastructure and digitally-inspired forms into the urban ecology (urbanmediaaesthetics.com.) As part of this ongoing project that blurs the lines between new technologies and the art world, Corriel’s work, poses relevant questions such as, how are digital practices redefining conceptions of artwork, originality, aesthetics, experience, and time-space, and site-specificity, what kind of discourse is created among digital media, the urban environment and artistic practice, and if the democratization of art is really a myth or reality. Highly romanticized or not, Video Salon, is the perfect place to snap a not-so-regular art selfie, while thinking of the emergence of urban, hi-tech software art in our daily lives. Free food-for-thought without even having to set foot into the gallery space? Maybe, the art world functions better outside the bubble, after all.